I think I have that one . + on the Jazz III XL's! They sound great with Ernie Ball Power Slinkys. I use Gator grip .71/.96 mostly, thumb pics, Mxr carbon copy, … fabulous little helpers! Jim's basic white thumbpick has been my go-to thumbpick from day one. I've bought a truck load of the other thumbpicks over the years from other manufacturers and boutique shops in an attempt to find something better sounding and cooler looking, but I always come right back to Jim's basic white thumbpick. You might remember a while back I did a highly scientific study of picks made from various materials; i.e., I played them all on my D25M with medium phosphor bronze strings and I listened to them! 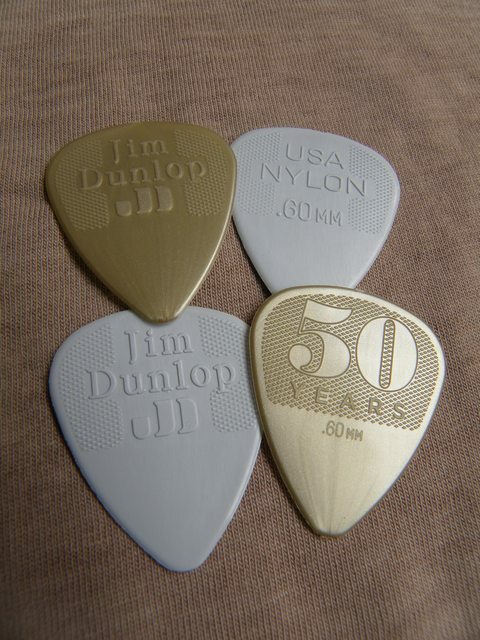 Anyway - ivory, ebony, brass, steel, etc...the best sound came from the good ol' Jim Dunlop nylon picks.